The “Bastias Theatre” is demolished and works are under way for enhancing the archaeological landscape, such as the restoration of the ancient Koile road, as well as excavations that led to newly-found antiquities. 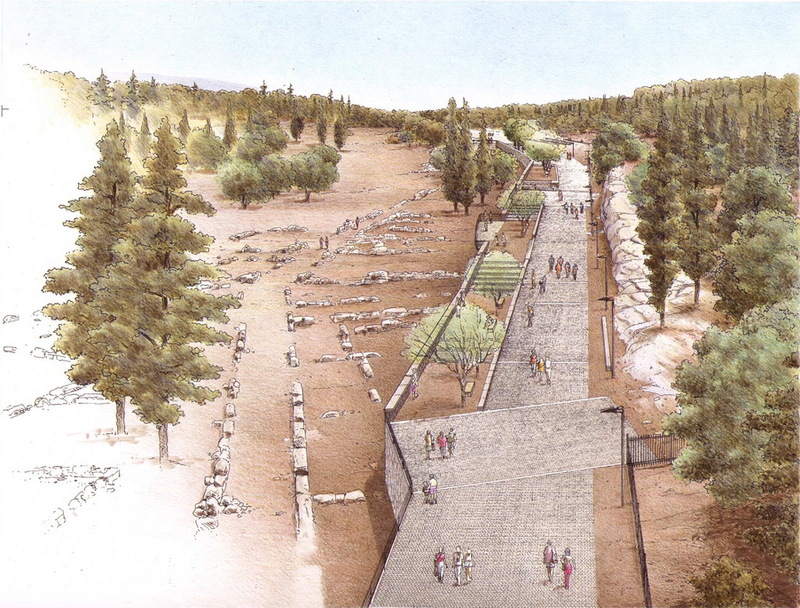 Τhanks to this major project a large, “open-air” museum is created; today an itinerary, appropriately adjusted for strolling, connects Dionysiou Areopagitou, Apostolou Pavlou and Ermou Streets, reaching as far as the Kerameikos Square. The “Grand Promenade” is “ad infinitum in the possession of the city”. The so-called “Grand Promenade” as envisaged by the study group of the construction company PLEIAS: Apostolou Pavlou Street. Left: the area of Melite. Right: the planted eastern slope of the Pnyx. A perspective drawing by Petros Zervos (2000).